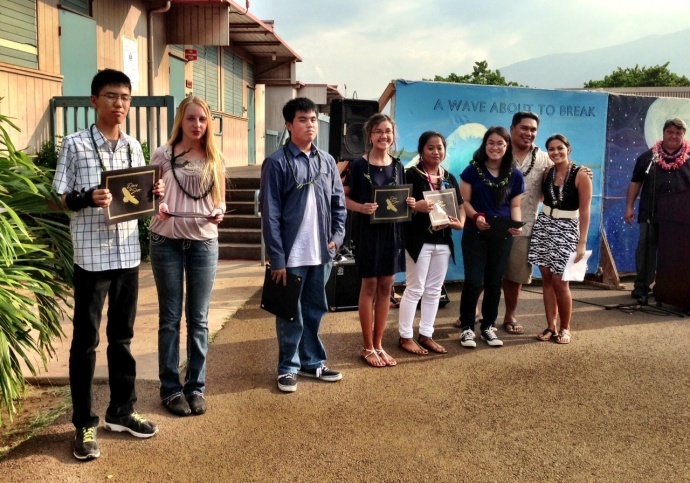 Top winners: (L to R) Wesley Sakutori (5th), Sydney Dempsey and Mitchell Gray (tied for 4th), Alexandria Tyau (3rd), Renezel Lagran (2nd), Rachel Nagamine (1st), with Essay Co-founders Roderick Pontemayor and Brittany Yap, and Maui Waena Principal Jamie Yap. Photo courtesy Brittany Yap. 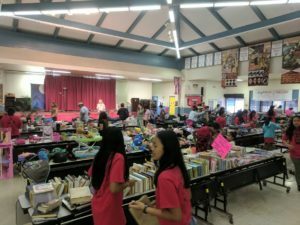 Maui Waena Intermediate School eighth grader, Rachel Nagamine was honored with the top award in the school’s first-ever community-partnered essay contest. 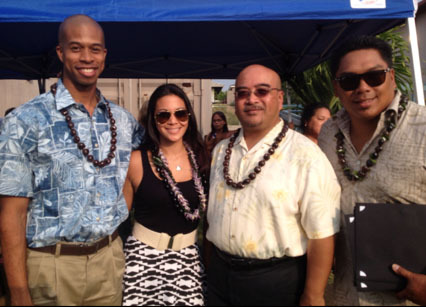 The Po’ohala Essay contest was founded by Roderick Pontemayor and Brittany Yap, and was named in honor of the late Po‘ohala Atay (friend of the contest founders, and a former student of the school). Contest organizers say the winning essays were based in part on creativity, critical thinking, vocabulary, grammar, and organization. 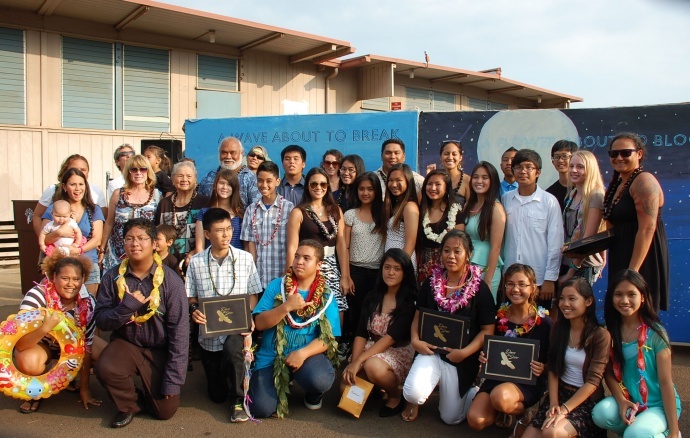 Winning group from Annual Po’ohala Essay Contest at Maui Waena Intermediate. Photo courtesy Brittany Yap. Nagamine takes home a $300 cash award and movie tickets. Twenty-nine other eighth graders were also awarded a total of nearly $1000 in various cash awards and prizes in the contest. More than 330 eighth graders participated in the contest in which students were asked to select one of three topic questions and write a 2-4 page essay. “We wanted to do something fun that would help students become more confident at essay writing and that would prepare them for high school and college,” said Yap in a press release announcing the winning entries. 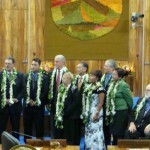 Contest officials in the annual Po’ohala Essay Contest at Maui Waena Intermediate. 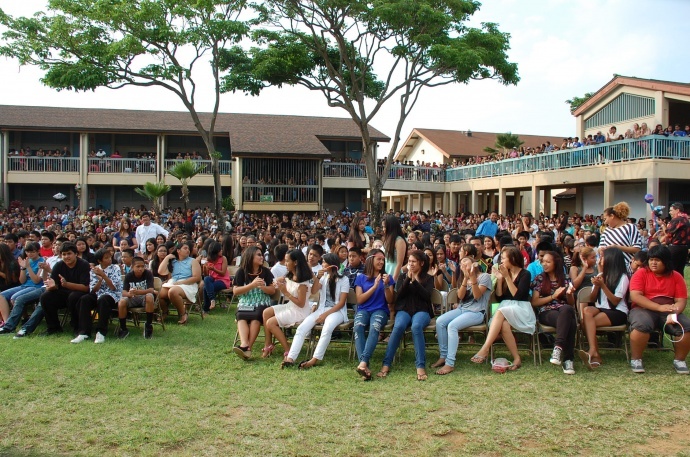 Participants in the annual Po’ohala Essay Contest at Maui Waena Intermediate. Photo courtesy Brittany Yap.